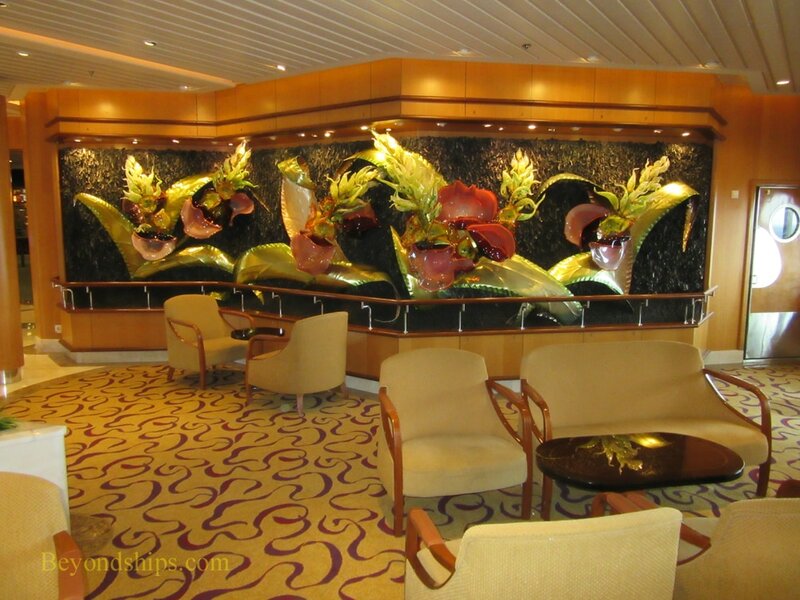 Freedom of the Seas is an expanded version of the popular Voyager-class cruise ships. 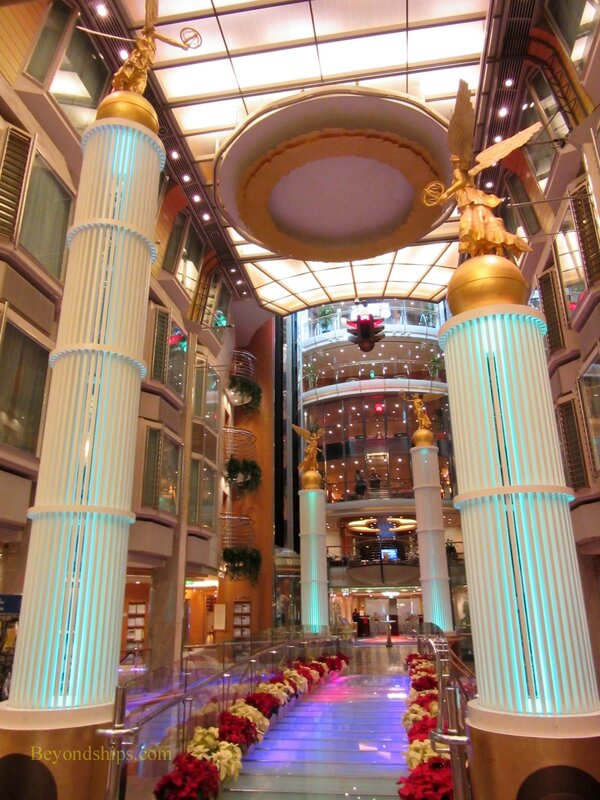 Her sister ships are Liberty of the Seas and Independence of the Seas. 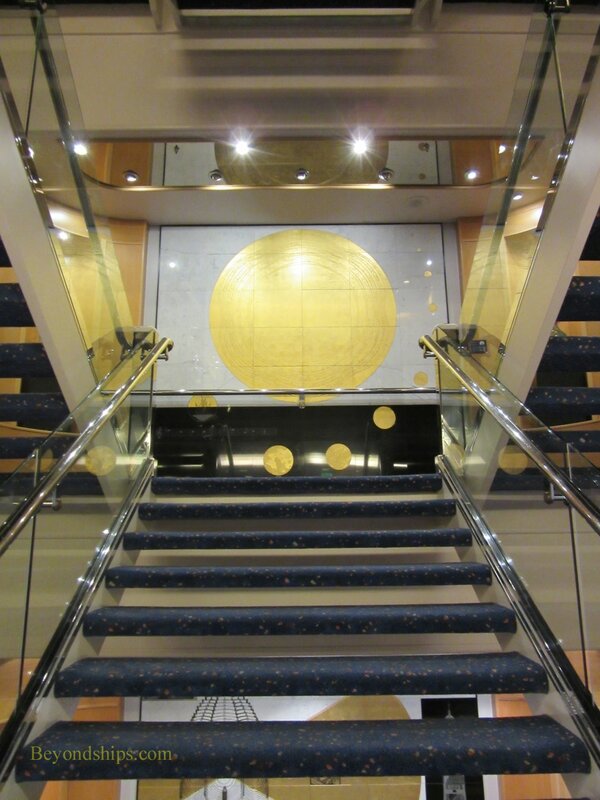 At over 154,000 gross tons, Freedom is a very large cruise ship. She can carry more than 4,000 passengers. But at the same time, she has the space to have a wide array of features. designed to appeal to people with an active lifestyle. 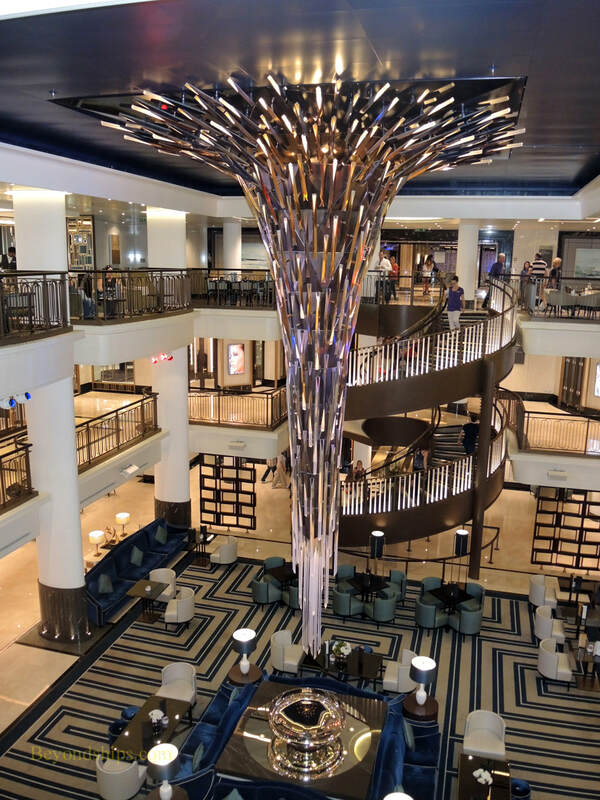 The decor is often flashy. However, some areas such as the grand main dining room are quite traditional. Nautically, Freedom has a maximum speed of 22.5 knots, which is about average for modern cruise ships. She has good maneuverability in port. The ride is usually comfortable but there can be movement in bad weather. 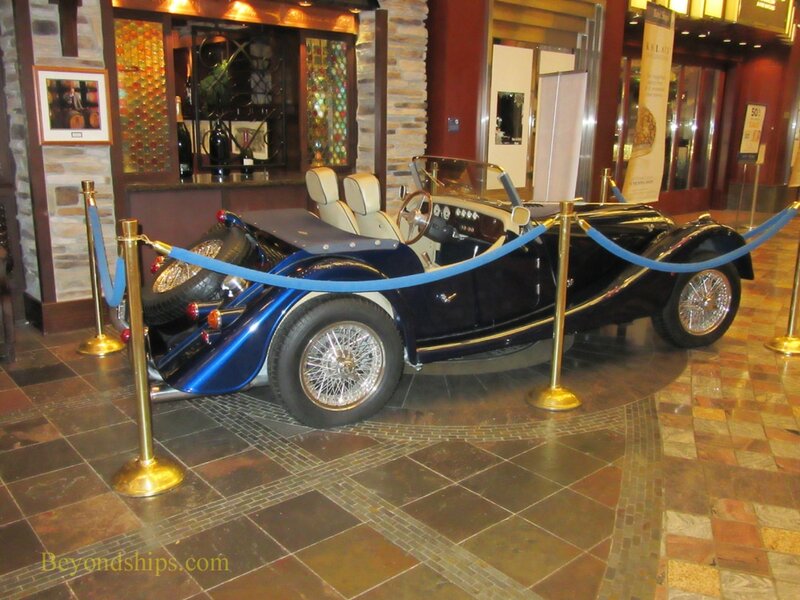 A traditional on the Royal Caribbean ships that have a Royal Promenade is a classic vehicle parked on the promenade. 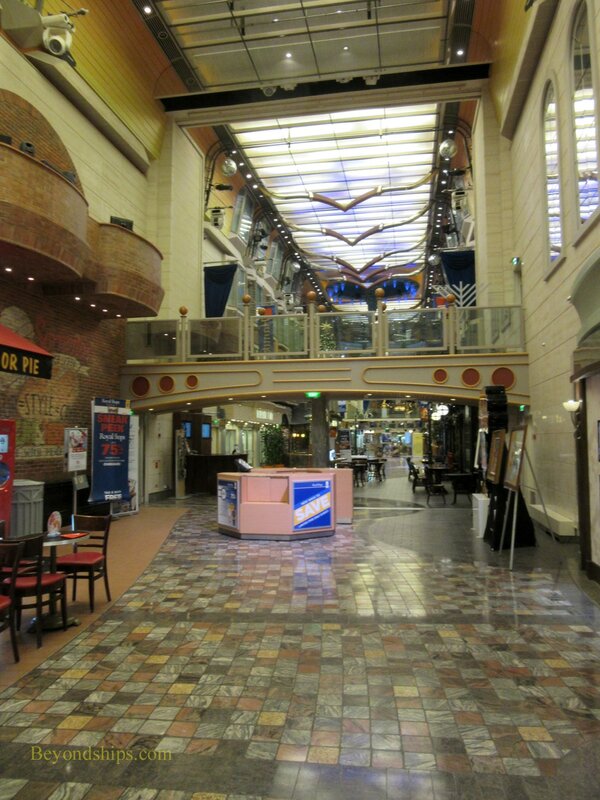 public space, a ship's main street. 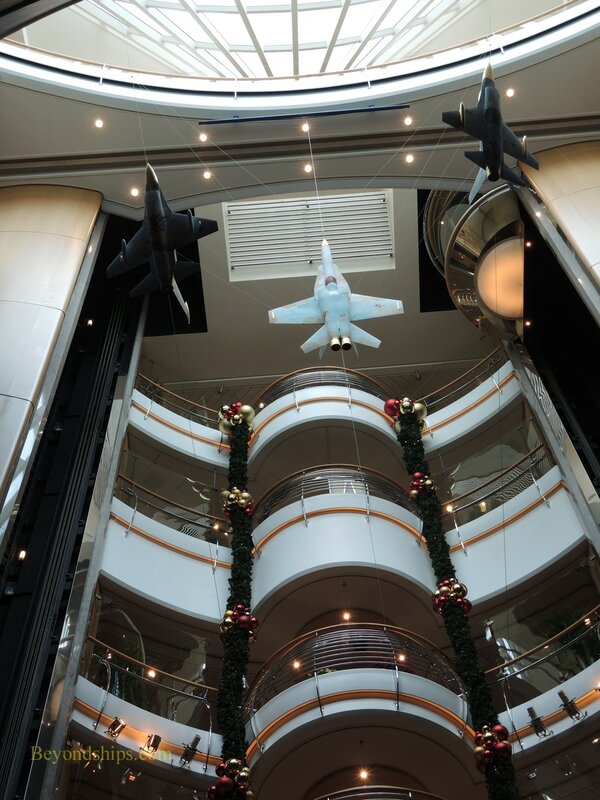 At either end of the Royal Promenade are multi-deck atriums. One features a set of giant traffic lights at the top (below left) while the other features sculptures of brightly painted jet fighters by artist Antonio Riello (below right). Freedom has a large art collection. 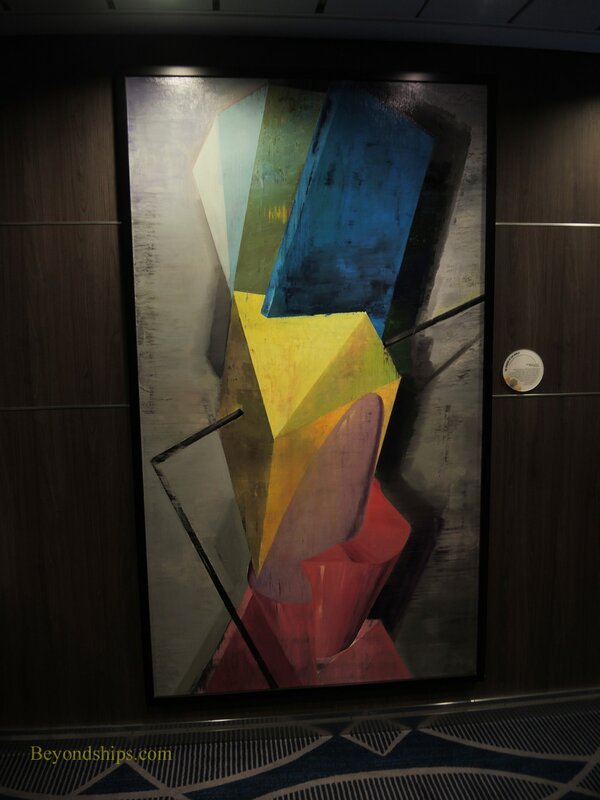 Each of the art works onboard is intended to relate to the theme of the four basic elements: earth, air, water, and fire. 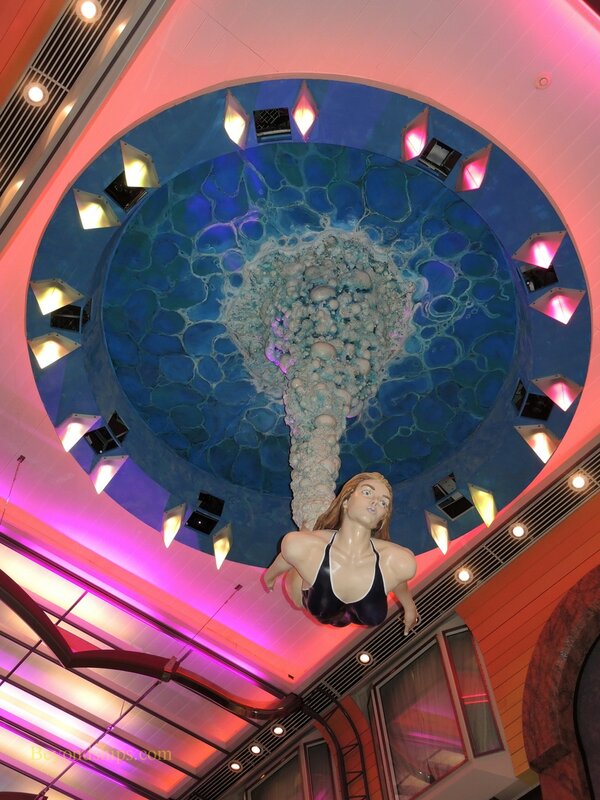 Most of the works are contemporary and are sometimes whimsical. 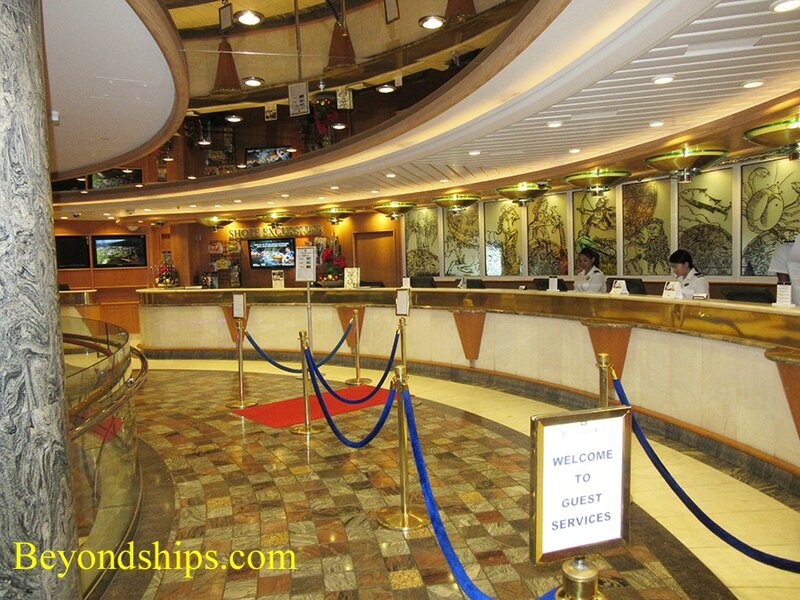 The Guest Services desk (above left) and the Shore Excursions desk (above right) are next to each other towards the aft end of the Royal Promenade. 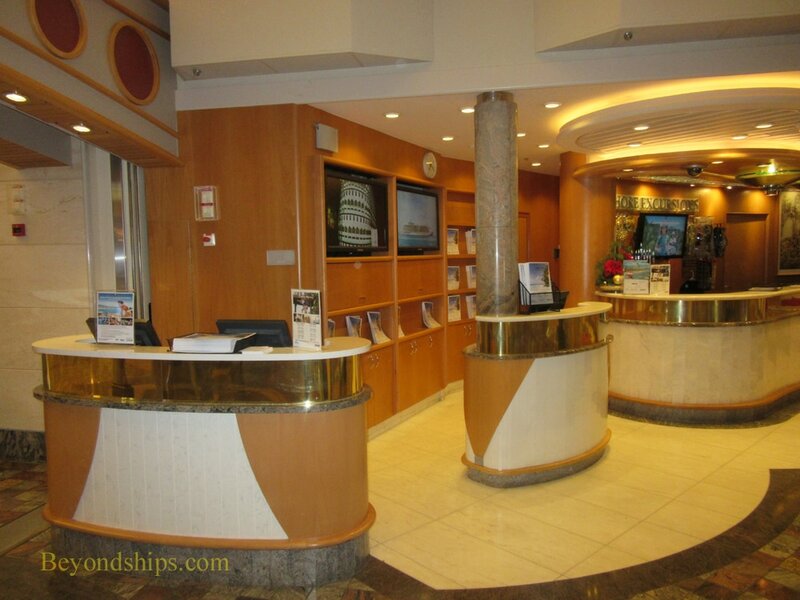 Guest Services acts like the reception desk at a hotel. 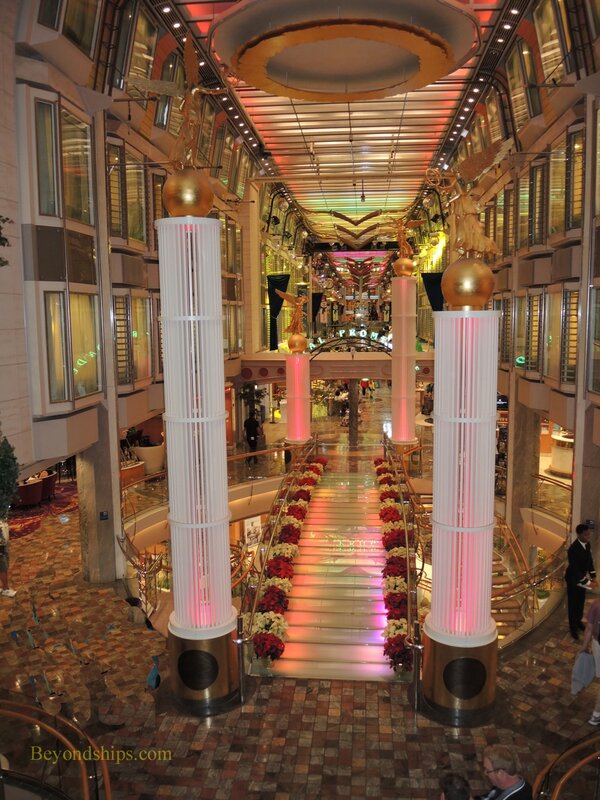 Shore excursions sells tours and activities in the ports. 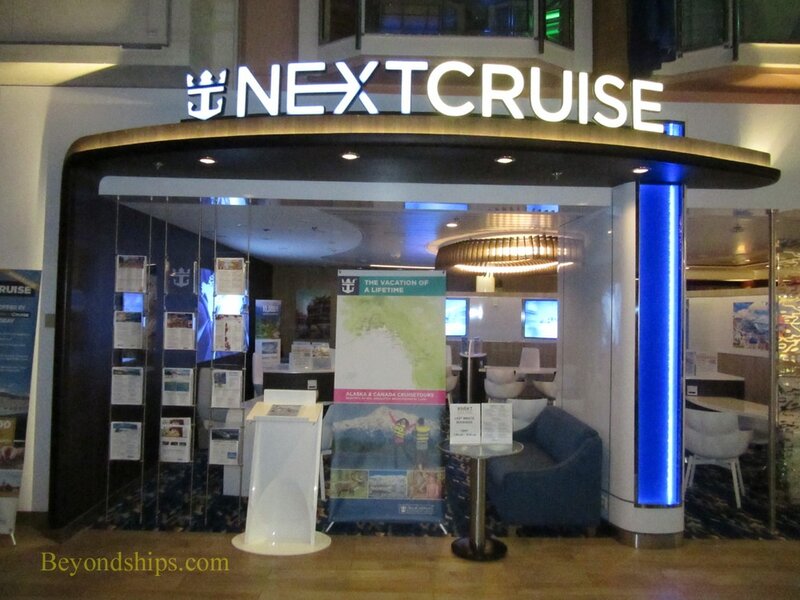 Also on the Royal Promenade is the Next Cruise office where guests can book future Royal Caribbean, Celebrity, and Azamara Club cruises (below left). 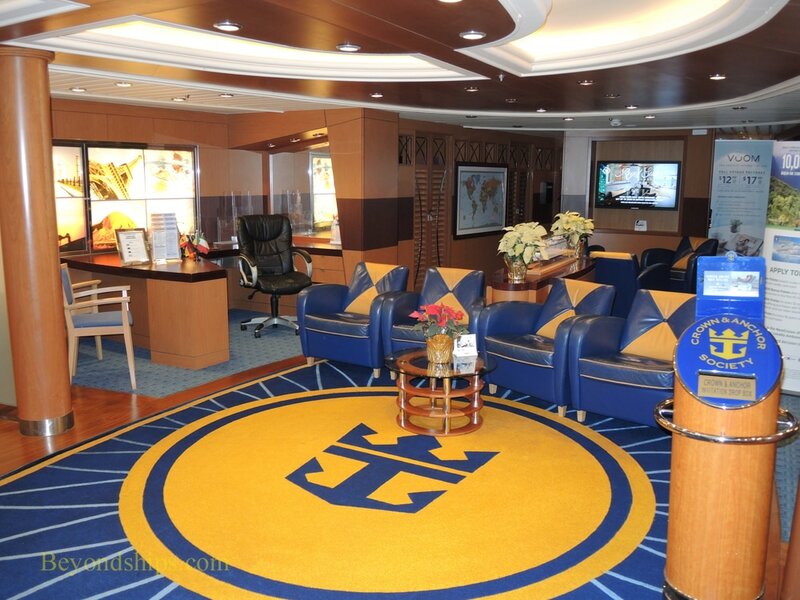 ​Upstairs in the aft atrium is the office for Royal Caribbean's past guest loyalty program, the Crown and Anchor Society (below right).